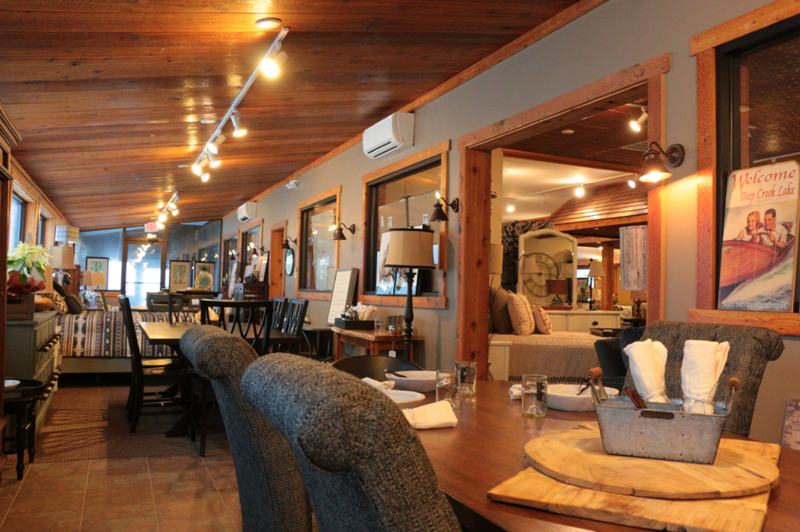 Our retail showrooms are open to the public and located in a comfortable, casual setting along RT 42 (Friendsville Road). The diagram above gives you an idea of the space we have and how the furniture is categorized and grouped. Of course, our staff will be there to guide you through the 4500 square feet of good stuff and our creative assistant is there to put design issues into perspective. This is where we show the largest portion of furniture and accessories; brands like Craftmaster, Universal & the Loloi collection of rugs and pillows, among many others. Lots of warm neutrals on "new" contemporary pieces with a particular focus on comfort and textures. It's in the front of our building, mostly glass and the most like a home setting of all the showrooms. Sometimes we feature The Magnolia Home Collection here in all that streaming light. Magnolia has a great sense of place, the sunlight (even in the winter) just brings it home. To the right of Showroom One we have another 4000 ft. gallery. You can expect to see our more rustic and eclectic set-ups here. There's a bit more color and the materials and construction tend to be more varied; stick and log beds and living room groupings and some more traditional pieces.